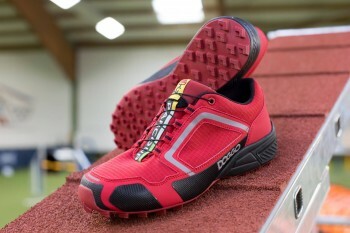 Parcours Red are characterized by an extremely high and good cushioning in the heel and forefoot. The high heel and the lateral reinforcements give the foot a very good side support. An ankle twisting in strong and quick changes of direction is significantly minimized. 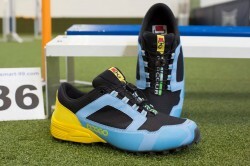 The sole has a very good anti-slip profile is suitable for both outdoor as well as for indoor artificial turf. All models are waterproof. A great choice of modern and fresh colors make this exceptional shoe a real eye catcher in the scene. " 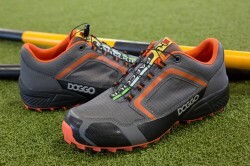 Perfectly suitable with a sole for grass and artificial turf. Improved hold on the sides and at the heel. This shoe fits very well to the soil conditions. The shoe is super comfortable to wear. Ideally hold with ligament problems. 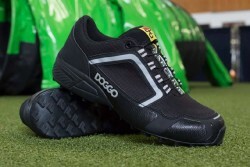 With this shoe you can also all other sports such as natural Agility, flyball, Dogfrisbee, disc dog, THS, Dog Dance, Obedience, IPO. or Dogscooter'n exercise.